The vibrant display of the spring vegetable escabache. 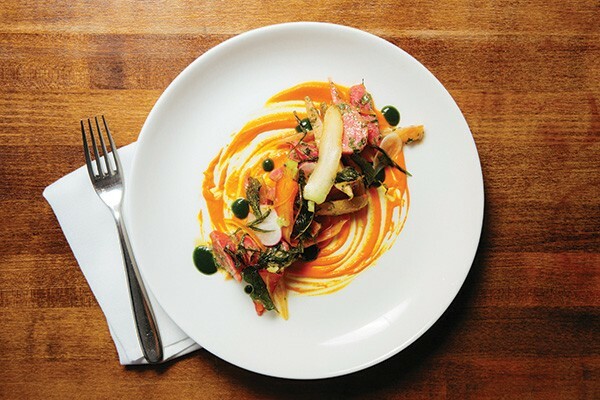 Of all the small towns in the Hudson Valley, Tivoli surely won the lottery when Rei Peraza decided to open his restaurant, Panzur, in this Northern Dutchess County enclave four years ago. 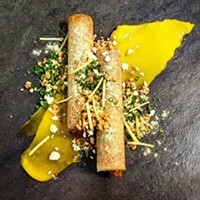 Offering "small-ish" plates of tapas-style cuisine which are essentially canvases for Peraza's playful and inspired artistry, Panzur melds big city gastronomy with rustic simplicity and delivers an exquisitely enjoyable meal. The menu of snacks, plates, sweets, and drinks changes from season to season and week to week (or even day to day). Peraza embraces seasonality at every possible turn. Even the aesthetic of the dining room brings the outside in. There's an entire wall of windows framing flowering pear trees and trellises of climbing wisteria that will give way to lush summertime greenery and vibrant fall foliage. The sleek wood block tables and suspended filament bulb lighting keep it simple. It's easy to imagine how this open and welcoming space would transform into warm and cozy in winter. "It feels the way we wanted it to feel. It's homey. It isn't intimidating. We want to drop your guard a little bit and then hit you with food. We can do some progressive food in an environment like this," Peraza says. Yes, the food is progressive and a little whimsical and delicious. But first, when you are asked if they can start you off with something to drink, be sure to answer yes. 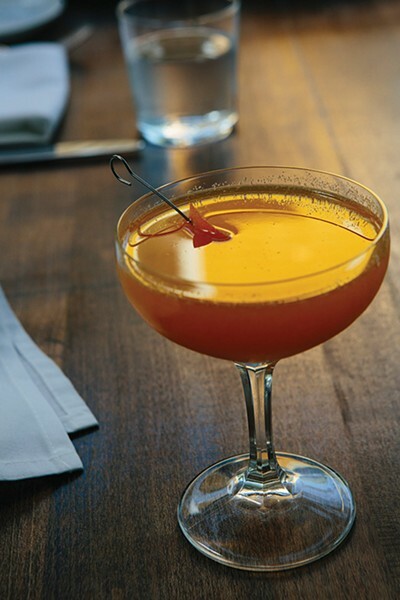 One of the spring cocktails, Changing of the Guards ($12) is an experience all its own. Though gin and tonic are components of this drink, it can't even be compared to a G&T. Peraza says they work "massively hard" on their cocktail menu and it shows. 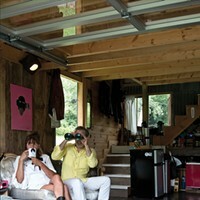 The selections change frequently to match the product available and the mood of the moment. "Gin to me says spring," says Peraza, "it's extremely floral." City of London gin, to deliver just the right flavor profile for this lovely libation and tops it with a tincture of lavender and Meyer lemon. It's like a day spa in a glass. You'll find yourself savoring the effervescent perfume with each sip. For those seeking a bolder beverage, try the Pickle Back ($11). Peraza's wife, business partner, and front-of-house maven, Kim, describes it as "very Brooklyn." It's a parade of concoctions featuring a shot of Four Roses bourbon, a house made guindilla pepper and pickle brine chaser, and a beer. Peraza just tweaked the recipe, adding ramps for a bonus seasonal punch. The cocktails are not to be missed, but even greater care is given to the wine selection. The wine selection of course represents Spain, but Peraza says they really go after stuff they fall in love with, no matter the region. "Our philosophy is simple—keep the wine list fluid. It's in constant evolution just as the wine is. We are constantly tasting and evolving, making seasonal adjustments and hopefully offering our guest special experiences no matter what the price range." Starting your meal off with the Coca ($19) is no mistake. It's a flatbread of epic proportions. Arriving on a rustic plank paddle board that exceeds the width of the table, it sends a very clear message. This is going to be fun and delicious, now relax and break some serious bread. A recent incarnation was loaded with coffee roasted pork shoulder, smoked onions, and cheddar and topped with a sous vide egg yolk, like a gloriously painted golden ribbon down the middle. The sous vide technique, a cornerstone of molecular gastronomy, involves submerging Cryovac packed food into a waterbath for slow, (I mean, slow!) low, gentle cooking. 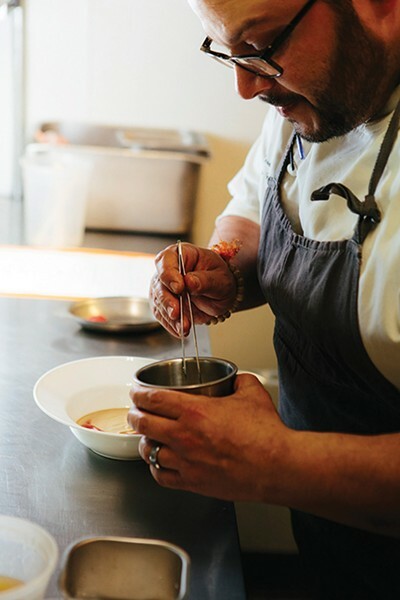 In the hands of Peraza, this technique is more than a party trick, it's a great way to make that egg yolk cooked, yet drippy and so very beautiful. The menu playfully dances between rustic and refined. Choose from the more traditional tapas fare, like croquetas (a fritter with flair) or a complement of cheeses and cured meats. The sour cherry-sherry glazed pig belly ($12) is the gateway menu item that keeps diners coming back. Or dabble in what Peraza calls his compositions. "I'm a believer in opulence. If I'm going to cook with caviar, you're going to get a big spoonful," he says. The burrata ($15) was particularly stunning, plated with a mushroom-asparagus escabeche, vibrant green ramp-pistachio romesco, and asparagus powder. The acid bite of the pickled vegetables partnered with the rich creamy decadence of the burrata (fresh mozzarella with a soft oozy center of cream), was scrumptious. They serve it with spoons, but if no one is looking, you might have to lick the plate. It's easy to make a meal of the "small" plates, and it's a lot of fun to sample and share. But if you prefer an entrée, Panzur does those as well. Though the proteins are familiar—chicken, fish, steak—the preparations certainly aren't. They've done a take on steak and eggs with grass-fed brisket, sous vide for 48 hours and served "medium rare." That's kind of crazy talk. 48 hours. Medium Rare. Peraza says it coagulated the proteins really slowly so it had the best of both worlds. It tasted like a pot roast and felt like a New York Strip. "Food should be comforting, it should make you feel good. Intellectual is my job. I want to think about it so you can enjoy it," says Peraza. If you're thinking of something even more imposing, call a couple days in advance and order a feast that serves up to 10 people. 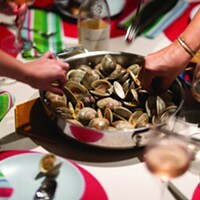 With options like Suckling Pig Porchetta ($475), Paella ($275), or Hudson Valley Duck and Foie Gras ($500 for four to six people), why cook at home when you can bring your next family gathering here? The desserts are certainly outside the box—not a molten lava cake or tiramisu to be found. But by now you know you are in good hands, so take a risk and you might be pleasantly surprised. The roasted beet and chocolate brownie with tarragon ice cream ($10) sounds mighty tempting. And the green tea panna cotta ($10) is a feast for the eyes. It's topped with a cannelle of striking black sesame ice cream and crunchy black sesame shortbread crumble, side by side with a duet of lemon and rhubarb that creates a vibrant and stunning work of art. If you're tired of overly sweet desserts, this beauty's for you. Peraza's passion is obvious on every plate and in every glass. "I need to cook," he says. "That's one of the main reasons why I wanted to be in the Hudson valley. There's a lot of awesome people out here who have the same feelings I have about cooking. Whether they are growing asparagus or beef—that passion needs to be here." 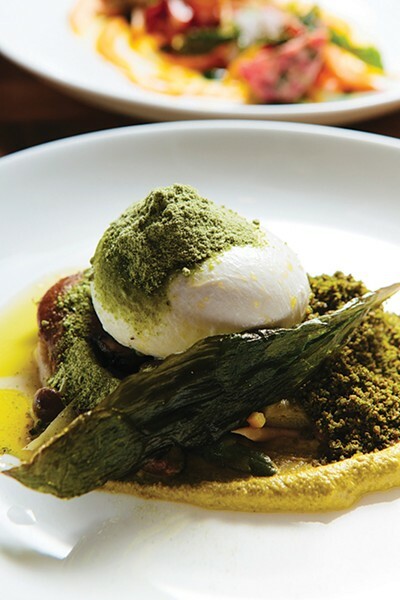 It's one thing to head to the city for an evening of modern and progressive food. But it's another delight entirely to have it in our own backyard. Without the fuss and fanfare, Panzur delivers interesting and exciting cuisine in an extremely approachable way. "Food is like love," says Peraza. "It's the most complicated thing on the planet and it's the most simple at the same time." Panzur,located at 69 Broadway in Tivoli, is open for dinner Wednesday through Sunday from 5:30 to 9pm, until 10pm on Friday and Saturday. (845) 757-1071; Panzur.com.